Valves are concave on the ventral margin, sometimes with scarcely visible swellings on the ventral margin, marking the position of the proximal raphe ends. Valves have a slightly convex, flattened dorsal margin. The apices are set off dorsally by a fairly steep sloping shoulder. Apices are capitate and rounded. 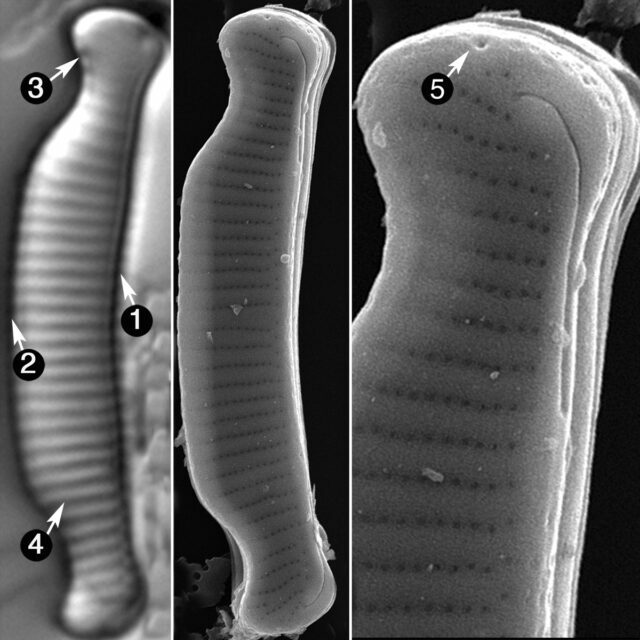 Helictoglossae are not visible in the LM. 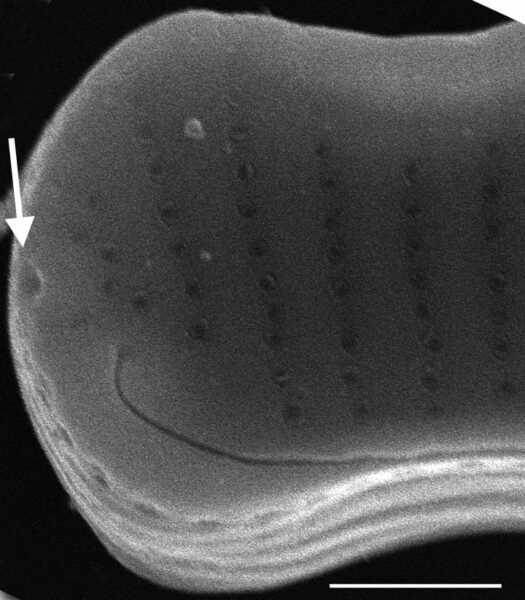 One apical rimoportula at the center of the apex, with a distinct external pore (visible in SEM). Striae are parallel to slightly radiate. Eunotia cataractarum is commonly found in the epilithon or epiphytic on bryophytes at waterfalls, and occasionally in streams in the Great Smoky Mountains National Park. Valves concave on the ventral margin, sometimes with scarcely visible swellings marking the position of the proximal raphe ends. Slightly convex flattened dorsal margin, with apices set off dorsally by a fairly steep sloping shoulder. Apices capitate, rounded. Helictoglossae not visible in the light microscope. Rimoportula at one end of valve, at the center of the apex, with a distinct external pore. Striae parallel to slightly radiate, 15 – 20 in 10 μm in the valve center, 16 – 19 in 10 μm at the apices. Puncta 44 – 50 in 10 μm. 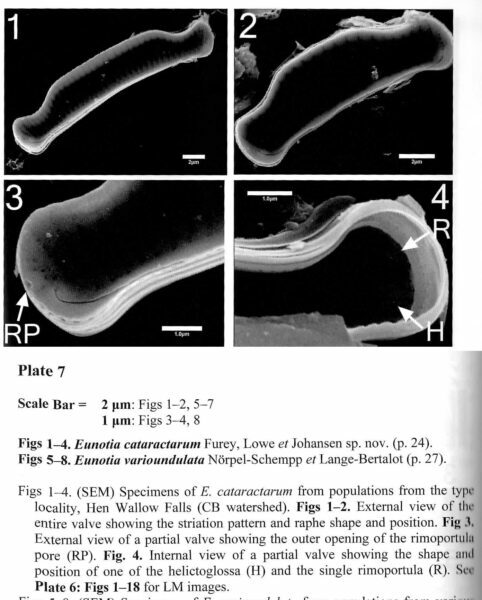 Valves with a concave ventral margin. The dorsal margin is slightly convex and set off dorsally by a steep sloping shoulder. 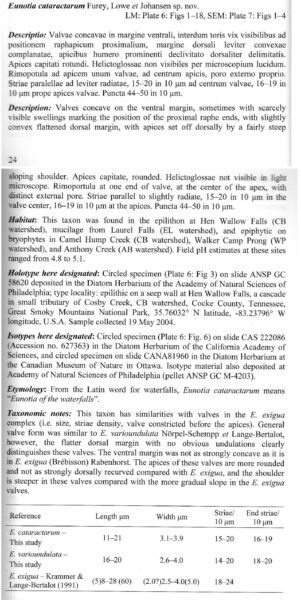 Apices are capitate and rounded. Striae are parallel to slightly radiate. 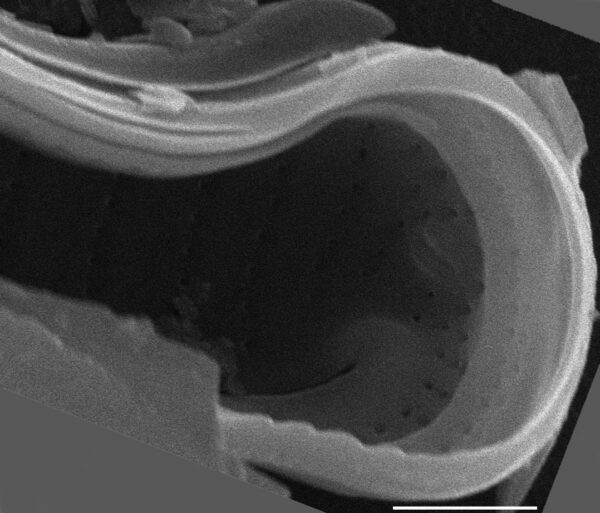 One apical rimoportula at the center of the apex (visible in SEM), with a distinct external pore. .